When he left Germany in 1933, the Nazis put a price of 20,000 marks on his head. The Albert Einstein Website Online contains the most comprehensive information and detailed links about Albert Einstein on the Internet. Learn more about the German born physicist who developed the special and general theory of relativity, who won the Nobel Prize in Physics in 1921, and is generally considered the most influential physicist of the 20th century. What became of Einstein's Brain? Albert Einstein (14 March 1879 – 18 April 1955) was a theoretical physicist, philosopher and author who is widely regarded as one of the most influential and best known scientists and intellectuals of all time. A Nobel laureate, he is considered the father of modern physics. He received the 1921 Nobel Prize in Physics "for his services to Theoretical Physics, and especially for his discovery of the law of the photoelectric effect". His numerous contributions to physics include the special and general theories of relativity, the founding of relativity or relativistic cosmology, the first expansion of physics since Newton, the prediction of the deflection of light by gravity (gravitational lensing), the first theorem which explained the Brownian motion of molecules, the photon theory and the wave-particle duality, the quantum theory of atomic motion in solids, the zero-point energy concept, the semi-classical version of the Schrödinger equation, and the quantum theory of a monatomic gas which predicted Bose–Einstein condensation. This web site was developed by a mathematician and a physicist. The primary aim of this site is to enthuse young people, and those who influence them, about the beauty and truth within physics. At the same we would like to help build a greater public awareness about Albert Einstein, science in general and physics specifically, and their positive and beneficial roles in society. 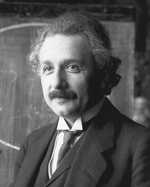 If you know of any other sites or resources regarding Albert Einstein, his work or his life, that you would like to see included online, please feel free to email me Joseph Prindle, and I'll try to find a good home for it. Please visit other sections of our website online to learn more about Albert Einstein, the author Joseph C. Prindle, his movie A. Einstein, and his recent book Einstein's Tears. For further or more detailed information or inquiries, please feel free to contact us at 1-310-453-3624. "Any intelligent fool can make things bigger and more complex... It takes a touch of genius --- and a lot of courage to move in the opposite direction."